CONTEST IS OVER!!! WINNERS WILL BE ANNOUNCED SOON! 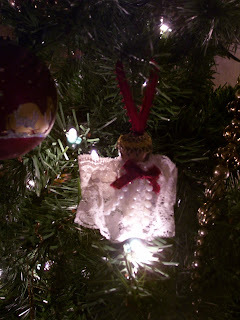 You are still welcome to comment and/or link your memories here until Christmas. Thank you so much to those who participated. UPDATED PRAYER REQUEST: Please pray for the Henninger Family. Kimberly’s firstborn son, Hudson was born still at 30 weeks. They are now expecting again(10wks. ), and facing another possible difficult pregnancy diagnosis. If you are missing someone you love this Christmas, someone of ANY age who is spending Christmas with Jesus this year, I hope you will join us on this very special Walking With You. We are sharing our Christmas memories and the ways that we remember our loved ones who have gone home to heaven at Christmas time. If you do not have a blog or do not wish to link a post, you may leave your Christmas memories in the comments below. If you do a post on your blog, come back and link up on the MckLinky following this post. 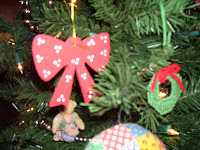 Everyone who participates and/or leaves a comment on this post, will be eligible to win our Christmas Memory Giveaway. For grieving moms, we are giving a copy of the amazing Beauty Will Rise CD, a copy of the book Mommy Please Don’t Cry, and a beautiful Creations from the Heart memorial bracelet (available exclusively from Sufficient Grace Ministries)…so three different moms are eligible to win. There are also three eligible prizes that could be for someone who has experienced loss at any age: a copy of the CD Beauty Will Rise (because I think it would comfort ANY grieving heart), the book Someday Heaven, and a Merry Christmas From Heaven ornament (if the ornament arrives in time…otherwise, I may have to replace with another memorial ornament).Each person gets one prize…so 6 people will win! With Heaven’s Choir up here. Just to hear the angels sing! Or the love He has for you! I love the poem above. Such a beautiful message that seems to come straight from heaven. Although we are here missing our sweet babies and others we love, they are spending Christmas in all of heaven’s splendor with the very King we celebrate during this season of hope. And because He came, we have great hope. How do we remember our babies (Faith, Grace, and Thomas) who are in heaven? Each year, we fill three shoeboxes with gifts for Operation Christmas Child, which we then donate to the pile of boxes collected by our church for their annual donation. We fill two little girl boxes in memory of Faith and Grace and one little boy box in memory of our Thomas. It is a small thing, but it blesses me to be able to buy some little gifts in their memory and give them to another child in hopes that it will bring some joy. It is something tangible we can do to remember them every year. 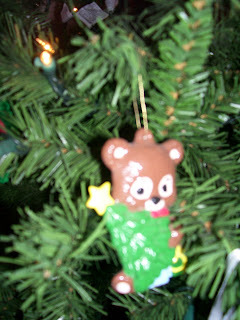 Christmas ornaments hold so many memories. Every year, we take them out and remember when our children made this or that, we remember where and why we bought this one, and think about what each one signifies. They sort of tell the story of our families. 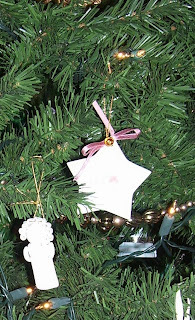 During the early years after our babies went Home, there were ornaments chosen in memory of each child. 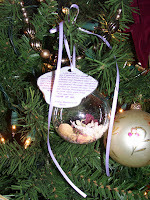 Faith and Grace were born still so close to Christmas (November 3rd) that we received many ornaments in their memory. Here are a few of my favorites, in no particular order. 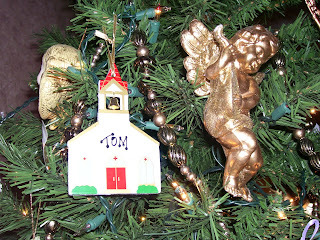 Thomas’ gold angel and his ornament with his name. Although, I probably wouldn’t have called him Tom. After doing this post, I decided we needed to add some better ornaments for Thomas. We were going to do a Noah’s Ark theme for Faith and Grace’s nursery. A dear friend, and the mother of my best friend from high school gave us this ornament the first Christmas we spent without our little girls. Not long after Faith and Grace went Home, our sweet baby cousin (about 18 mos. ), Corbin also went Home after complications from a congenital heart defect. His mommy and daddy gave us this ornament. Another friend also gave us the same one. We love them both. 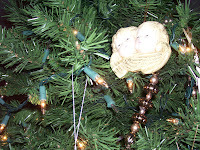 Amazingly, there seemed to be many of the twin angel ornaments that year…or maybe it was just that we noticed them for the first time. The parents of two little girls from my home daycare gave us this musical ornament. 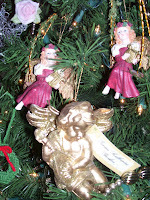 Mom and I searched endlessly for two ornaments that really captured the spirit of our little girls that first year. I fell in love with these two little girls swinging on swings and playing their harps in heaven. Now on to my mama who is probably decorating her corner of heaven as we speak (blog). She loved Christmas…yes, I know I’ve already told you that a thousand times. Her tea sets are all over my house. She loved those,too. 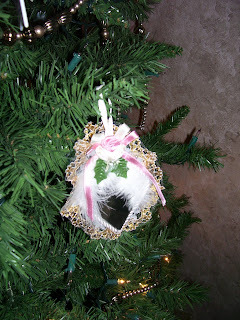 Below is an ornament that was given to me by my friend, Stacie, after mom’s passing. It is filled with dried flowers from her funeral. 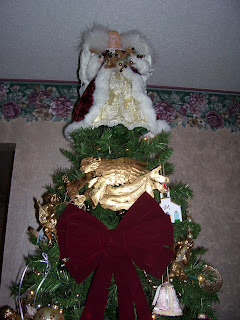 Prior to mom’s last Christmas with us, I went over to her house and put up her Christmas tree. She laid on the couch just beside me as I took out each ornament. We shared the memory wrapped in each one and laughed as we remembered the stories behind them. 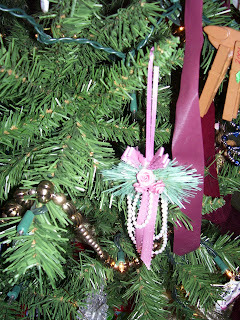 Mom loved to make things, and every year, she would have a new hand made item (or items) to add to the tree. Every year had a theme. It was like watching the story of her life. That’s what a Christmas tree should be. 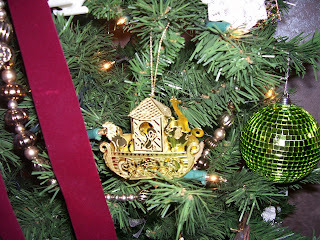 Now, several of those ornaments grace my tree… they are part of my story. One of my personal favorites…macaroni angel…oh yeah…you can make an angel out of anything! 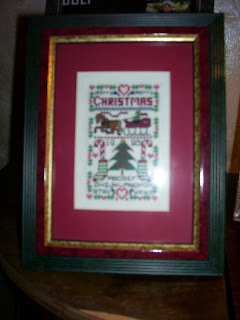 The cross stitch frame that mom gave to my brother’s fourth grade teacher (who was also my fourth grade teacher) many moons ago. The Christmas before last, that same teacher who is now my co-worker, gave it to me for Christmas. She said it had been part of her Christmas decorations every year and she wanted me to have it. It was like receiving a piece of my mom. Every little piece means so much. More than two thousand years ago, the world ached for salvation, swelled with yearning for deliverance, redemption, restoration…for a Savior to rescue from sin and death. And He came…a baby King, born in a lowly stable on a quiet night to a peasant girl and her betrothed…a carpenter. He was in the still, small voice when He whispered past Elijah. And He was in the quiet stable birth when He came to rescue us and sent His angels to tell the lowly shepherds the good news. His name is Jesus…and He came for me. His name is Jesus…and He came for you. And Because He came…there is hope for tomorrow and a promise of a joyful, forever reunion. He will wipe away all of the tears and wash away the loss and regret. He will cleanse and forgive and clothe us in robes of white. The empty arms will be filled. The hungry hearts will be fed. Brokenness will be restored. Mourning will be turned to dancing. And sin and death will be no more. Because He came…He will carry us through this life. And because He came…He will come again…in all His glory…to take us home. Thanks for letting me share some of my Christmas memories of my loved ones in heaven. I look forward to reading all of your memories, and pray that you will find comfort and hope in the truth that He came for you, as you remember this Christmas season. Thank you for that poem, just beautiful! We lost our lovely daughter 3 months ago yesterday and trying to find positive ways to remember her has been my goal. I love this blog and though I don't comment much, I read every post. After reading your post, mine sounds like a much needed "venting" session. I haven't really wrote any posts lately, and have kept it all inside. Probably not a good idea. You have made so many beautiful memories to hang onto. You seem to handle the holiday very well. I hope that I can find more beauty in the future. It's been hard, and I know that you know exactly what I'm talking about. That's why I really enjoy having you and all these ladies as my friends. I don't have to try to explain my pain. Thank you again for doing "Walking With You." I hope you read this comment. I may just email you to make sure. I haven't always been in this place with our losses at Christmas…and there are always still the daily moments of "missing". The early years were VERY hard without our babies. And…the loss of my mother still feels quite fresh. Healing takes time. And we will always miss our loved ones until we meet again. I'm glad you wrote what is on your heart right now…from the place you are currently walking. That is why we are here…to walk together and encourage and pray for one another. I'll be over later today to read your post. Kelly, the timing of this Walking With You is huge. I had my first real greiving session at our Christmas MOPS meeting. Ugh. I was thinking about how Mary must've felt holding her newborn, knowing he was born to die. And I thought back on my few hours holding Duncan…. I was unprepared for how strong and powerful the tears and raw grief would be, but it felt good to sob and cry out to God in my grief. Thank you, as always, for hosting WWY. I am glad we can share how we remember our children at Christmas. This is our first Christmas without Carleigh and our 7th without Jordan, although it's only been since last year that we celebrated Christmas for Jordan. I like both poems that you shared. Christmas is such a special time of year (and my favorite) and it can be hard to spend it without the ones you love. I think it's wonderful to get gifts for children in memory of your babies. Thank you for hosting this special Walking With You. Just yesterday I found your blog, but still wanted to participate. I have now become a follower. What a beautiful way to share loss and grief, as well as remember our beautiful babies who've gone to be with Him. Again, thank you. This is such a perfect theme for Walking With You – the holidays are such a tough time when you are missing loved ones. I love this idea! It's so helpful to see what other mommies are doing to cope. Thanks! I really wanted to link up and do a post of my own but we have a friend visiting from out of town and my youngest has had the flu this week. Ahhh. This is a beautiful post and such a wonderful way to remember our loved ones. This is our second Christmas without Grady. Last year I was still in shock and not sure how we were going to incorporate him into our lives here on earth. 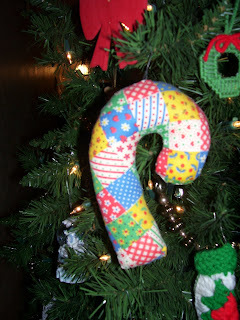 I have several Christmas ornaments on our tree for him and I'm searching for the perfect stocking to hang for him. I have a Christmas ornament on the tree for my mom that has the last verse of the "Christmas With Jesus" poem on it. We also remember her by making biscuits and homemade chocolate syrup on Christmas morning for breakfast (a southern tradition for many years in our family). After my dad died, my mom switched our tree to one with all white lights…but she would strategically place one blue light in the front of the tree near the top in honor and memory of my dad. Wishing you peace this Christmas. Sending you love and big hugs, too! what a wonderful idea. thank you for hosting this. I will be posting as blog soon about my memories. It's been great to receive tons of encouragment from mums who had been through the same, although sad that friendships had to be formed for this reason. I'm in my sad moment today, thinking about my princess. It's been 3 weeks since she left, and I'm not sure why I'm welling up today. What a great post and I'm so thankful for being able to share my feelings on here. When I lost my first it was hard and really didn't know where to turn, other than God. Thank-you so much Kelly for everything and I so enjoy reading all your posts. Kelly, this post is beautiful! Thank you for writing it. Unfortunately, I will not be linking up this time, as this will be my first Christmas after my miscarriage and I'm honestly not certain if I'm ready to deal with the feelings rolling around inside of me. The poem is beautiful and I appreciate this post so much. You are such a wonderful woman – your friendship is deeply cherished! I really enjoyed your post and I have enjoyed reading all the other ladies post ( that I have gotten to so far) to hear how they remember their children. Thanks again for doing Walking With You. I do beleive it has helped in the healing process! Thank you for sharing your stories and ours. Last year was my first Christmas without Levi and it was such a struggle. This year isn't easy but it has been easier than last. 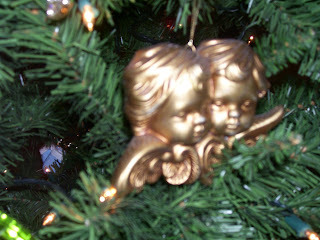 I love that you have twin angel ornaments and the cross stitching your mother did is beautiful!! I love this remembrance Kelly. Thank you for posting this poem too. I'm going to write a post and link here. I am going through a difficult season and I miss my mom so much. It's been almost five years since she went to heaven but I sometimes forget and want to pick up the phone and call her. I added my link, but I just wanted to say that this year is a little hard to remember. This year I couldn't take the old ornament box out, we went and bought all new things. I'm having a strange Christmas. Last year it was about loss, this year the 'would have been's' are raging, and the 'should be thankfuls' are fighting them. I'm full of confusion this year, just trying to start over. Make a new holiday since the old is so hard to recreate. Thanks for sharing your heart, your soul, and your beautiful words!! The words written, poems shared, and thoughts thought are those shared by all those going through loss! God is using each post you share and I am thankful for you! Apparently our mothers went through the same stages of crafting – my mom did the painting, the cross stitch, the ceramics – even the mauve phase. I really loved all the pictures. I hopped over from Debbie… and am so glad I did. 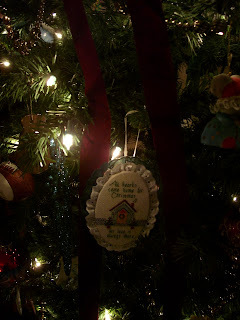 That poem, the post you did about your tree and the special ornaments and the story behind them through the years… my tree also has special ornaments with stories behind them. I loved reading your post even though this is my first time to visit here. The warmth is evident, and the atmosphere so welcoming. I didn't even feel like I was a stranger like I sometimes feel when I'm visiting a blog for the first time. May your memories continue to warm your heart this Christmas. I will try to do one post about a Christmas memory. My dear husband passed away a little over a year ago, this is our family's second Christmas without him. We all miss him. He loved Christmas so much.